According to a recent NY Times article titled “Be Yourself Girls, Order the Rib-Eye“, when it comes to first dates, that may be the case. (Hat tip to Open Left and Eating Liberally where I first saw this posted). While I certainly like women who are unpretentious, down to earth, thin and low maintenance, food is something near and dear to my heart. Isn’t ordering something with the strategy of making me like you better a dirty, nasty way to play tricks with my heart? How dare you use food, the world’s most pure and honest substance, to deceive me! Ouch! Whither the salad? What about the women who genuinely just love salads? Aren’t we all the mood for a light salad sometimes? My advice to the single female readers of this blog: Be yourself. With all the effort and preparation you are already putting into trying to impress on a first date, just leave the food out of it and order what you genuinely feel like eating. Oh, and for any guy who thinks this means women won’t judge you for ordering a burger on a date, the article makes sure to throw water on that good news fire. Yes, that’s right men, if you order a burger, just be warned, it could still cause women to think you are a fatty fat fatty who is going to die early. Sorry guys, but life isn’t fair. Until it is, guys, gals, do yourselves a favor, keep enjoying those first, second and third date steaks. 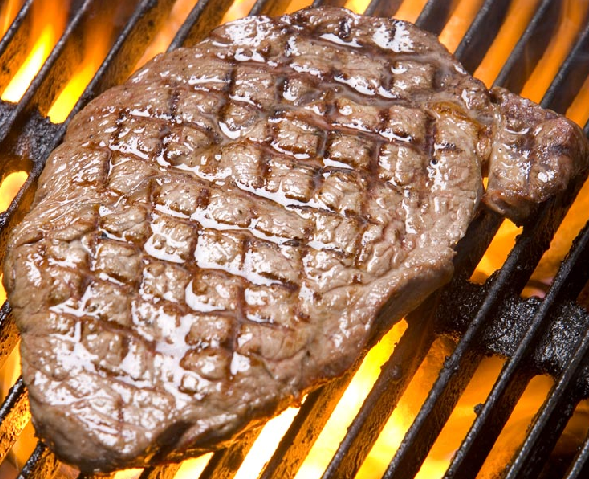 Mmmmm….steak……so good. I only go on last dates. The trick is to not order anything significant and when she storms out, finish her dinner then wash it down with tears. Actually, salads are deceiving… with the types of toppings, salad dressing and serving sizes they frequently contain more calories, fat, etc. than a typical dinner of red meat, steak, or other allegedly “fattening” food choices. And, what did the article say about steak salad? Does that mean that the girl is ladylike down to earth girl?